I love strawberries because they’re one of the first fruits of the season. When they start to ripen then Spring has officially begun. One of my favorite things to do in the world is go strawberry picking. I’ve tried growing my own, but haven’t had much luck (thus far). I plan to try again at our new place and I’ve got my sights set on pints of homegrown berries in the future. This year, however I’ll have to get them from a local farmer. I normally pick 9 pints or more to eat fresh, freeze and make homemade jam. (My son normally eats about that many while we are picking.) I thought I’d put together this round-up of strawberry recipes for some new inspiration since strawberry season is just around the corner. I can’t wait to try to the ice box cake and fruit roll-ups. Which ones look good to you?? *A link has been removed due to suspected malware making this a list of 19 instead of 20. Do you pick strawberries? What is your favorite strawberry recipe? I’d love to know! Oh, I absolutely love strawberries! My favorite things to make with them are strawberry pie and shortcake. But those strawberry crumb bars need to go on my to-make list too! Great roundup! Just in time for strawberry season. We are going to pick our own in a few weeks, now I have plenty of ideas on what to do with the ones that don't get gobbled up right out of the crate. Perfect timing! Strawberries are so cheap in my area right now and I don't have enough recipes to use all of them up before they go bad. Thank you! 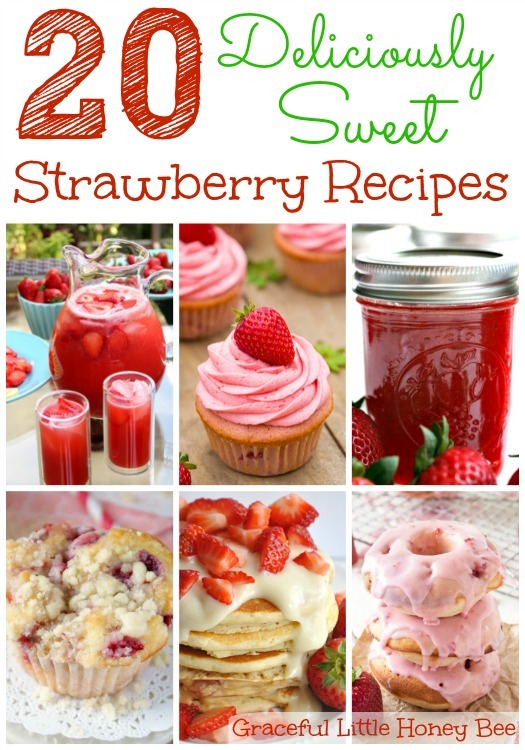 Love all of these strawberry recipes. Strawberries have been on sale in our area this past week and I was needing a few ideas. Perfect. Thanks Much. Dropping by from Thrifty Thursday.